Brunswick High School's Rosalie White (center) goes for a loose ball against Marshwood High School's Kayla Goodwin (right) and Celine Lawrence in a Class A South girls's basketball semifinal game at the Cross Insurance Arena in Portland. 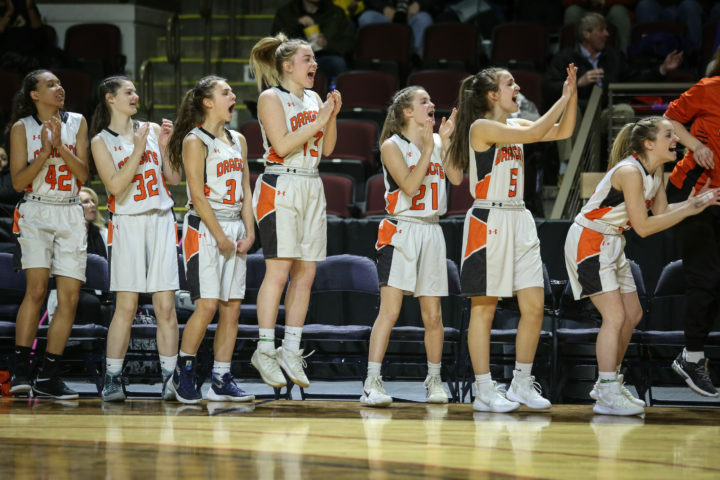 The second-seeded Brunswick High School girls’ basketball team secured its third straight Class A South final appearance Wednesday morning, but it didn’t come easy. Brunswick High School's Charlotte MacMillan shoots the ball in a Class A South girls's basketball semifinal game at the Cross Insurance Arena in Portland. 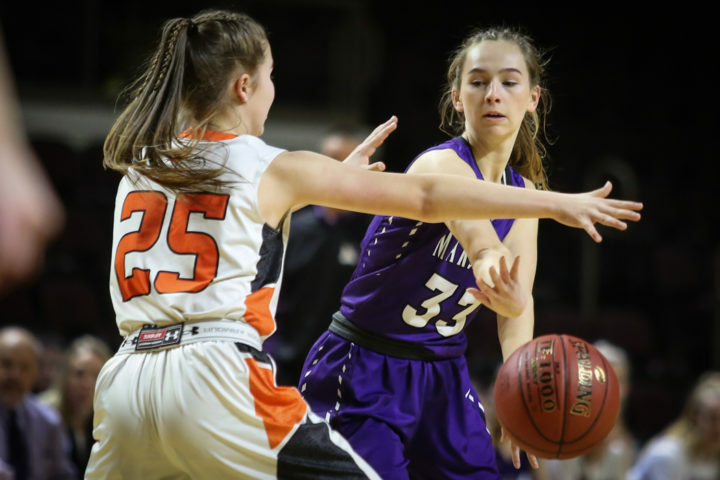 The veteran Marshwood High School put up a fight in a 51-46 semifinal round slugfest at the Cross Insurance Arena in Portland. Thirteen of the 17 players on the No. 4 Hawk roster are seniors, and the team has reached the playoffs all four years the girls have been in high school, reaching the semifinals in three straight years. 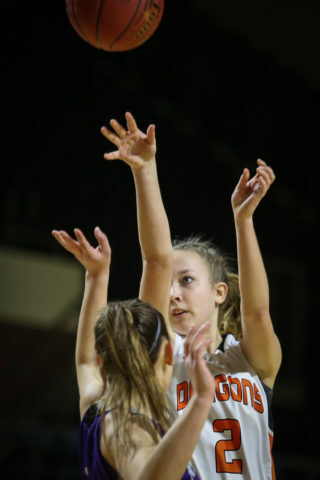 Senior Courtney Thim started the scoring Wednesday morning for the Hawks, followed by three-pointers by classmates Alicia Richards and Natalie Herbold to give the underdogs a quick 8-0 advantage. Brunswick fought back for a 16-13 lead at the end of the first quarter, but after nipping at the Dragons’ heels for much of the second quarter, Angelina Bisson hit a pair of free throws to put the Hawks back in front, 23-22, with 1:49 left in the second. Marshwood stayed ahead — leading by as many as seven points — until just less than three minutes remaining in the game, when a free throw by Dragon Emily Larochelle gave Brunswick a 44-43 edge. That came just moments after a three-point play — a post-up basket and foul — by teammate Charlotte MacMillan tied things up. The teams traded leads once more before Brunswick’s Logan Brown sank a three-pointer with just less than two minutes to go to put the Dragons up for good, 47-45. Rosalie White led Brunswick with 16 points, followed by Larochelle with 15 and MacMillan with 11. The balanced Hawks got points from eight players, with Bisson leading the way with 11. 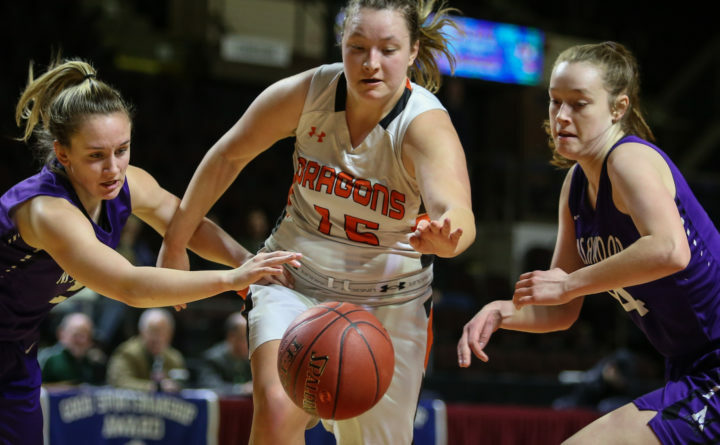 The only team to defeat the now 19-1 Brunswick this season has been Greely High School of Cumberland, who the Dragons will see for the third straight year in the regional final. Greely knocked the Dragons out in the Class A South final last year, while Brunswick topped the Rangers in 2017 to advance to the state title game. Marshwood finishes its season with a 15-5 mark. Marshwood High School's Natalie Herbold basses around Brunswick High Schools Logan Brown in a Class A South girls's basketball semifinal game at the Cross Insurance Arena in Portland. The Brunswick High School bench cheers during a Class A South girls's basketball semifinal game at the Cross Insurance Arena in Portland.